Grand Wayne Center Ushers Receive 2011 Lt. Governor's Hoosier Hospitality Award! Grand Wayne Center Ushers Receive 2011 Lt. Governor&apos;s Hoosier Hospitality Award! Visit Fort Wayne and The Indiana Office of Tourism Development are pleased to announce the Grand Wayne Center Ushers have been awarded a 2011 Lt. Governor&apos;s Hoosier Hospitality Award. This 14-member group serves as the "face" of the Grand Wayne Center, greeting guests as they visit Fort Wayne. 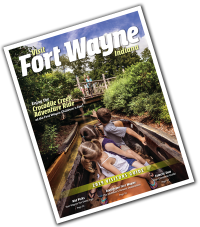 Nominated by Visit Fort Wayne, the Grand Wayne Center Ushers exemplify Hoosier Hospitality and exhibit superior dedication to Fort Wayne and to our hospitality industry. Congratulations to this well deserving group!